When a child dies, the tragic event leaves grieving loved ones with endless questions. 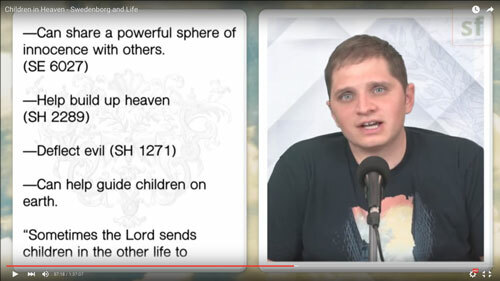 In this insightful and comforting episode of Swedenborg and Life, host Curtis Childs and featured guests review Swedenborg’s beautifully detailed vision of children in heaven. Throughout several volumes of his writings, Swedenborg describes how children look, behave, grow, and connect with their loved ones in the afterlife. While it may not answer every question you have, it may bring some much-needed clarity and peace to your soul. Often times, the first question a loved one has about a child who has died is: “Are they all right?” In an excerpt from the book Hello From Heaven!, a mother who feared her baby may not be in heaven because he hadn’t been baptized before he died shares her account of how the Lord showed her that her son was safe. If Swedenborg were alive today, he would have also told this mother she had nothing to fear because all children go to heaven. Curtis was joined by special guest Marilynn Hughes, founder of the Out of Body Travel Foundation, to discuss the first thing a child may experience when they get to heaven. Even Swedenborg’s own writings seem to show agreement with Marilynn’s spiritual experiences. And it’s not just individual angels who take care of children in the afterlife. Swedenborg saw entire communities in heaven that were devoted to taking care of infants and children who had died. When a child’s life is cut short, many feel the biggest tragedy of it is that their potential will never be realized. But Swedenborg says children still get to learn, play, and experience joy and growth in heaven, which Curtis explains in this clip. In Secrets of Heaven 2296, Swedenborg describes the atmosphere where children learn as vividly alive and playful. Marilynn Hughes adds that she’s even seen the Lord become playful in the environments where children inhabit heaven. The thought is very comforting, but many also want to know if children can progress past childhood in the afterlife; and Curtis covers Swedenborg’s take on that very topic in the next section. At the beginning of this segment, Curtis describes the physical challenges for babies who are trying to learn how to walk. In contrast, Swedenborg depicts heaven as a place where children can develop and learn more quickly and easily than on earth. 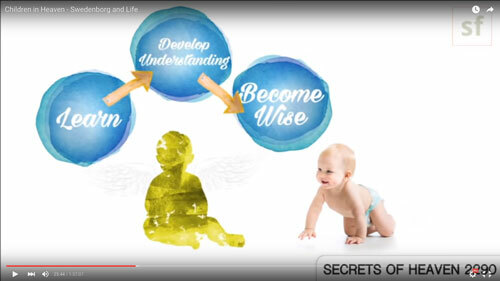 Swedenborg further elaborates on children’s ability to learn, understand, and become wise while in heaven in this illustrated excerpt from Secrets of Heaven 2290. Just as children on earth grow physically from the nutritious food they eat, angelic children grow spiritually from the wisdom they consume in heaven. In Marilynn Hughes’s spiritual experiences, she saw angelic children learning in schools in the afterlife. 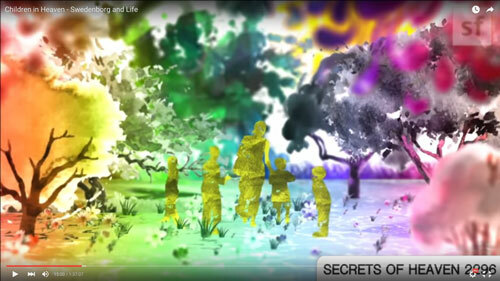 Swedenborg had similar accounts of learning centers as portrayed in this animated clip of Secrets of Heaven 2299. Curtis, whose sister died in childhood, even has a family member who encountered similar learning situations in her spiritual connections with Curtis’s sister, as she shares in this clip. Swedenborg says that even though angelic children are taught in heaven by angels and the Lord, they still have a sense of independence and are even encouraged to maintain their sense of self, as described in this passage from Secrets of Heaven 2294. At this point it may look like living in heaven is better than living on earth, and you may naturally wonder why we all can’t live there, especially if a child you love is already there. As painful as it may be, there is a reason we’re all on different paths. While it may seem like life on earth is pointless when life in heaven is full of meaning, Swedenborg warns that even angelic children face challenges. The first of these is to earn true innocence through wisdom, as explained in this animated passage from Heaven and Hell 341. 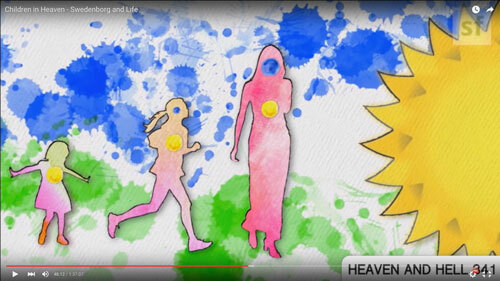 Marilynn Hughes joins the conversation to add some of the ways she’s seen children in heaven serve important roles. Adults in heaven and on earth serve important roles, too, so we can’t really say one is better or more useful than the other. Each individual life, here and there, is serving a very unique and useful role in a way that may be difficult to understand now; but it will all make sense in the end. Is there an enduring and unbreakable bond between babies and children who’ve died and their loved ones on earth? Swedenborg answers this question based on his experiences in two passages, Heaven and Hell 494 and Secrets of Heaven 2304. Curtis’s own father, whose daughter died at a young age, shared a vivid dream he had that seemed to convey the eternal bond of parent and child. Another guest shared how she healed from traumatic loss during a spiritual exchange she had with her son who died at birth. 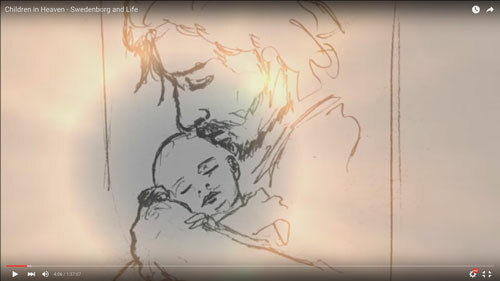 Innocence is a connection that bonds us to heaven where our loved ones are, according to Swedenborg. If we follow God, who is innocence itself, we will always be connected to heaven. This concept is explained more in a passage from his book Married Love. So if our connection remains, why don’t we have more communication and interaction with children who’ve died? Curtis and Marilynn offer some potential reasons for the lack of communication between angelic children and living loved ones. Related Swedenborg and Life Video: Why Don’t Those Who’ve Died Communicate With Us More? Even though Swedenborg and other modern mystics describe a powerful connection between the spiritual and physical worlds, it can be hard to feel it at times, so how can we build and maintain a connection? In this moving clip, one family shares how they maintain a connection between themselves and their daughter, who died of cancer at 18. Our special guest, Dr. Erica Goldblatt Hyatt, who has extensive experience with grief counseling, joins the conversation to offer some guidance on how spiritual practice can help ease the physical, mental, and emotional symptoms of grief. It’s hard to see in the depths of grief, but if people who suffer can find meaning in their life and in the lives of those they’ve lost, they will not have an existence devoid of happiness and purpose. So children in heaven learn to talk but in heaven they communicate in thought? What kind of intelligence and wisdom are children in heaven fed with? Someone once told me that my son would be my angel. Is that not true? How are the heavenly parents chosen? All of this makes it seem as though dying as a child is a good thing. Is this is so then what reason is there to live out one’s life in this world? I have heard of children with morbid schizophrenia. As in, they torture animals, etc. Are they treated differently? Or are they still looked at as being innocent children? Earlier it was said that innocent angels appear childlike, is this a permanent appearance? Or is it just in certain circumstances, because I thought everyone lived in the prime age? Want to watch more Swedenborg and Life videos? Visit our offTheLeftEye YouTube channel and be sure to subscribe for new uploads! Host Curtis Childs from the Swedenborg Foundation and featured guests explore topics from Swedenborg’s eighteenth-century writings about his spiritual experiences and afterlife explorations and discuss how they relate to modern-day life and death in a lighthearted and interactive live webcast format. When we wake up in heaven, Swedenborg tells us, angels roll a covering from off of our left eye so that we can see everything in a spiritual light. The offTheLeftEye YouTube channel uses an array of educational and entertaining video formats to help others look at life and death through an uplifting spiritual lens.